A new biography seeks to give rock star status to one of reggae’s most militant musicians, Davina Hamilton reports in this article for The Voice Online. LONG OVERSHADOWED by the mighty Bob Marley and even shunned by the Jamaican establishment for his outspoken political views, Peter Tosh, at last, has his story told in a new biography. Steppin’ Razor: The Life of Peter Tosh charts the life of the Jamaican guitarist and singer, who shot to fame alongside Marley and Bunny Wailer in the celebrated reggae group The Wailers. 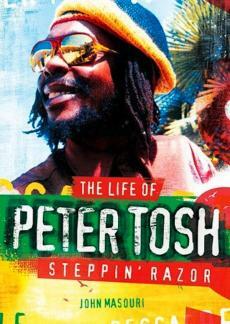 Shining a light on the revolutionary musician who reportedly taught Marley to play the guitar, and who vehemently called for the legalisation of marijuana in his hit song Legalize It, the book by respected reggae journalist John Masouri, seeks to posthumously honour Tosh, who was murdered in his Jamaican home in 1987. And according to Masouri, though Tosh was shunned and even beaten for his outspoken views on various social and political issues, he was a man ahead of his time. In addition to receiving literary recognition in Steppin’ Razor – which takes its title from Tosh’s song of the same name – the musician’s solo album Legalize It is also set to be the subject of a planned feature film from Oscar-winning British director Kevin Macdonald. Another posthumous honour came for Tosh in 2012, when he was awarded the Order of Merit by the Jamaican government – a feat that would have been unimaginable back in the seventies, when he was considered a thorn in the sides of the Jamaican establishment. In 1978, during Marley’s famous One Love Peace Concert in Kingston, Tosh lambasted attending politicians, Prime Minister Michael Manley and Edward Seaga, leader of the opposition party Jamaica Labour Party (JLP), for their failure to legalise marijuana. His public insubordination wouldn’t go ignored. Five months later, he was apprehended by police and beaten severely while in police custody. Regarded by many as an intimidating figure (perhaps not least because he was 6ft 4in tall), Tosh, like many other black activists, was the type of man the establishment wished to silence. Undoubtedly the most militant member of The Wailers (he famously slammed the group’s one-time label boss Chris Blackwell, referring to him in an interview as “Chris White-worst”), what made Tosh quite so revolutionary? “He was born black, poor and fatherless in a colonial society, governed by a ruling elite who had no interest in furthering the cause of people like himself,” Masouri reasons. Though Tosh’s outspoken nature and refusal to conform cost him international stardom (the decision taken by himself and Bunny Wailer to quit The Wailers, refusing to go on tour in 1974, meant the pair missed out on the global superstardom Marley achieved), Masouri says Tosh was not the type of person to put fame over his principles. “[Conforming] would have meant compromising his integrity and Peter wasn’t the kind of person to undertake that willingly. He really did practise what he preached on many levels and whilst mainstream recognition brings undoubted rewards, I think we should honour artists like him regardless. Steppin’ Razor is the culmination of a tireless effort from Masouri, who interviewed over 100 of Tosh’s former friends, associates and fellow musicians for the book. And despite his extensive reggae knowledge (several reggae artists have said after being interviewed by Masouri that he was able to remind them of facts they hadn’t even remembered about themselves), the author says he learned many new things about Tosh in writing the biography. Did Masouri ever meet Tosh? “I did meet him briefly, backstage at a show in London, and found him an imposing character. He towered over me in his wraparound shades, surrounded by his dread entourage and was very imposing. Still, Masouri is keen for Tosh to get his dues. A man who made playing the guitar look effortless (if he’d been any more cool and laid back in the video for The Wailers 1973 hit Stir It Up, he would have been sleeping), Tosh, according to Masouri is worthy of rock star status. “I wanted to write the book as an adventure story, and make it eminently readable to people who aren’t necessarily reggae fans or immersed in that culture. The idea was to present Peter’s life story in such a way that it could be afforded parity with that of any rock star.